Warren Buffett’s net worth is $82.7 billion dollars as of March 29, 2019, making him the third wealthiest person in the world, according to the Forbes 400 list. He is among the most successful investors of all time. He founded and runs the Berkshire Hathaway company which owns more than 60 companies including Dairy Queen, Geico and Duracell battery. Buffett’s father was congressman, and he started investing at age 11. Warren Buffett is approaching his 90th birthday and is vital and engaged. Despite his unique background, there’s much that savers and investors can learn from Warren Buffett. Known to live beneath his means and to generously share his wisdom, Warren Buffett has motivated legions of investors with his knowledge and investment style. This article is inspired by Warren Buffett’s writings and his lifestyle of conservative living and brilliant investing. Wealth-builders today can learn a lot from the fact that Buffett still lives in the home he purchased decades ago in Omaha Nebraska for $31,500. If you want to become wealthy, you must allocate some of your current earnings towards the future. By saving first, you eliminate the problem of not having enough money to save, at the end of the month. You also avoid having to budget, one of the most unpopular financial activities. To implement the Buffett approach to saving, invest a portion of your salary into a 401(k) and a Roth IRA. This not only guarantees that you’ll be saving for the future, but that you won’t be spending all your income. Then, direct another portion of your income into a short-term cash account, like a savings account, earmarked for emergencies. If you can, save another portion in an investment account, like Schwab or a robo-advisor like M1 Finance or Betterment for medium term goals like a new car, vacation or college. By setting up automatic deposit into these accounts, your financial future is secure. Spend what’s left and you’re certain to be on the right path to build wealth for tomorrow. You might imagine having an extravagant lifestyle if you were in Buffett’s shoes. Yet, the billionaire has simple tastes. Known for favoring Coke and McDonald’s hamburgers over a $100 meal, there’s a lot to learn from wanting less. From a man who could buy anything, “I’m not interested in cars and my goal is not to make people envious. Don’t confuse the cost of living with the standard of living.,” Buffett says. He is a champion of living within your means and income. Think, wait, and evaluate before spending. Consider, as you rip out your Visa card whether the $95 pair of shoes or new headphones today are worth sacrificing $950 at retirement? Invest $95 today in a diversified stock market index mutual fund like Vanguard’s S&P 500 (VFINX or VOO). Assume an annualized return of 9% per year. Wait 27 years, until retirement. The investment will be worth approximately $950. That’s the power of compound returns! Every time you spend money on something that doesn’t give you a return, you’re sacrificing your tomorrow. A simple rule of thumb is to multiply the cost of your spending by 10. And that’s an approximation of how much money you could have in retirement, if you invested the money instead of spending it. Is it worth going out to dinner for $100 if you could have $1,000 more in retirement? Warren Buffett keeps billions of dollars on hand, just in case. If an outstanding investment opportunity arises, he has the money to act. For you and me, having extra cash on hand means that if the stock market falls, we have cash on hand to buy good stocks at bargain prices. Then there’s the day-to-day financial surprises. Emergencies happen… to everyone. Recently, we had a small fender bender. This set us back $1,000 for the auto insurance deductible, and our premium went up a few hundred bucks. If you lack enough savings for emergencies, when that unexpected bill comes along you might be forced to take on credit card debt in order to pay for the unexpected expense. If you pay $1,000 to repair your car and don’t pay the bill immediately, here’s how much you’ll end up paying the credit card company. If you charge $1,000 on your credit card, which charges 18% interest, and you pay 2% of the remaining balance ($20 the first month), it will take you 151 months to pay off the $1,000. At the end of 151 months or over 12 years, charges will amount to $2,397 for an additional $1,397 in interest charges on top of the original $1,000. Pay the minimum and you end up more than doubling the initial charge. Join Warren Buffett and keep cash on hand for the unexpected. When buying a home or a car, you may need to borrow money. Realize that too much debt limits your chance to save money and become financially wealthy. Every dollar you put towards interest payments is one dollar that is not invested and growing your wealth. Just like money invested, compounds and grows for the future. Borrowed money compounds and increases the initial price paid for an item. Bufffett doesn’t hate debt, but recommends using it wisely. “I’ve seen more people fail because of liquor and leverage—leverage being borrowed money. You really don’t need leverage in this world much. If you’re smart, you’re going to make a lot of money without borrowing,” he says. Although that quote refers to borrowing money to invest, the principle applies to other types of debt as well. Warren Buffett suggests index funds for most people. Find out how to invest. If you are paying 18% interest on your credit card debt and earning 9% on money invested in the stock market, then you’re actually losing 9%. Make a plan to get rid of credit card debt now to move towards wealth and prosperity. The Stanford marshmallow test by psychologist Walter Mischel, PhD demonstrated how children who delayed gratification became more successful. When these same children grew older, their self-control remained and they were more likely to score higher on the college entrance SAT test, were better able to handle stress and concentrate without becoming distracted. The self-discipline the children illustrated in the marshmallow test is akin to the patience and ability to delay gratification that Warren Buffett demonstrates through his lifestyle and investing practice. He’s known to say that the appropriate time length for holding an investment is, forever. For many, it’s easy to become consumed with the day to day concerns. Yet, if you avoid saving and planning for the future, you’re likely to have a stressful retirement. 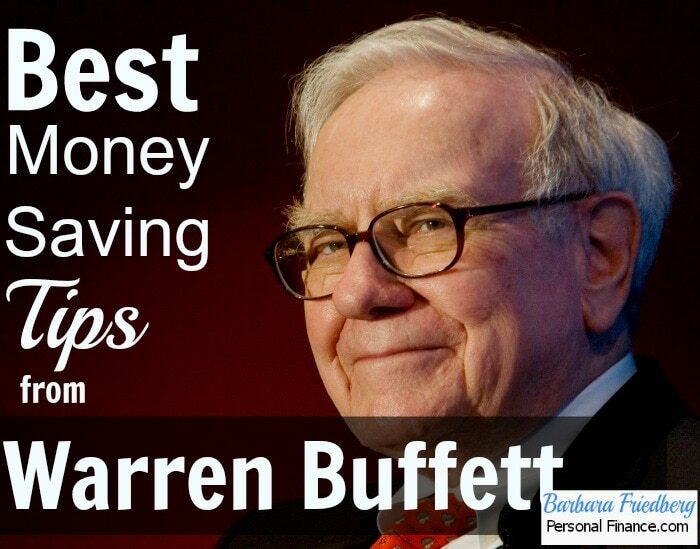 Money saving tips from Warren Buffett reminds us that money doesn’t grow overnight but takes a long time to build up. Waiting to spend money along with waiting for investments to grow, will yield great outcomes. Be patient and understand that the magic of compounding takes time. Invest for the long term. Start investing a small amount every pay period and over the long term, the money will grow exponentially. In the video above, Warren Buffett advocates a simple investment approach. Buy an S&P 500 index fund and hold it for the long term. In fact, that is exactly what Buffett instructed his attorney to do with the inheritance that he’s leaving to his wife! This isn’t as difficult as it sounds. If you’re working for an employer who contributes to your 401(k) retirement account, then you might invest $500 and if your employer kicks in $333 per month, you’ve met your $10,000 annual investment goal. With compound interest, the money that you earn is added to the existing amount and grows exponentially. The chart above shows the yearly value of investing $10,000 in the financial markets and earning an annualized 7% return. 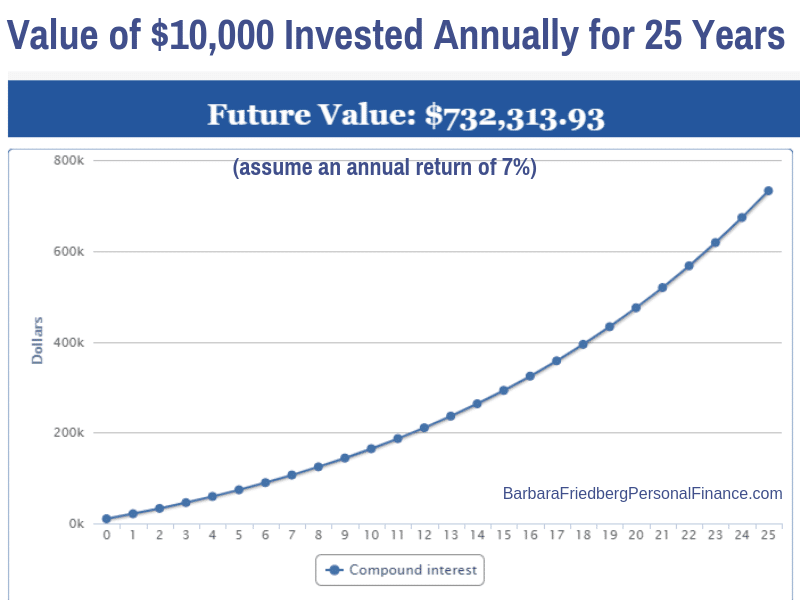 In 25 years, the annual $10,000 investment grows to more than $700 thousand dollars. So you see, with more time, your money makes more money on top of more money. Read the review and try one of my favorite investment platforms – M1 Finance Review. If Warren Buffett can live in the same modest home for decades, why do you feel you need to live above your means? We live in a middle-class neighborhood in a condominium in the midst of a large housing development in Northern California. I’m amazed at the apartment dwellers in the next building driving BMWs and Cadillacs when they could be putting that monthly payment towards purchasing a home and building long term equity and wealth. No matter how much you earn, there are strategies to spend less, and dial down your wants. The simplest way to live within your means is to desire a simple life. When you lower the bar, to your lifestyle, you can get off the “keeping up with the Jones” rat race and live for you. Live within your means and contribute to an investment account every pay period. Even if you don’t become as wealthy as Warren Buffett, you’ll be a lot richer than if you spent all the money that you earned. Warren Buffett frequently recounts a story of how terrified he was of public speaking as a young man. He would get nauseous and panicked before speaking in front of others. To combat his fear, he paid $100 for a Dale Carnegie public speaking course and credits that as one of his very best investments. In fact, halfway through the course he mustered the courage to propose to his wife. Investing in yourself can mean many different things. If you can advance in your job through education, then spend the time, money and effort to get a certificate or degree. If traveling to a conference means more contacts and additional clients, then spend the money. Saving is only important when using those savings wisely. Sometimes that means spending the savings on yourself, so that like your invested dollars, your efforts will compound by increasing your income. Save money by deciding where to scrimp and where to splurge. Start diverting part of your income into an investment account. Make a record of income and expenses and create a spending plan. 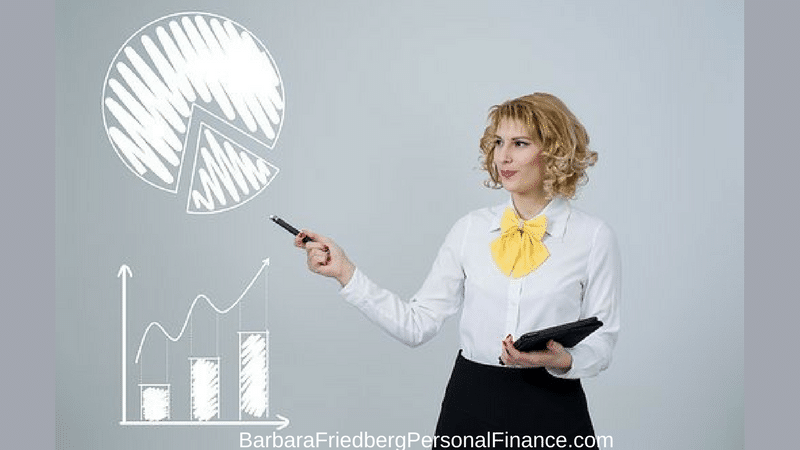 The post 8 Saving Money Tips From Warren Buffett appeared first on Barbara Friedberg.